Janet Pfeiffer, author of The Secret Side of Anger, has some great tips for reducing anger to make both your personal and professional life better. Ask yourself if the situation is worth getting upset about. If not, let it go. If it is important to identify what needs to change and create a plan to accomplish that. Switch your focus (thought) from the problem (negative) to the solution (positive). Stop what you are doing. This prevents the situation from escalating. These are daily activities to engage in that will naturally reduce your levels of anger. Some of my favorites are aerobic exercise, prayer, meditation, music, nature and my dogs. Each of these naturally replaces stress and anger with feelings of peace and serenity. Even the simple acts such as deep breathing or smiling will help alleviate anger. 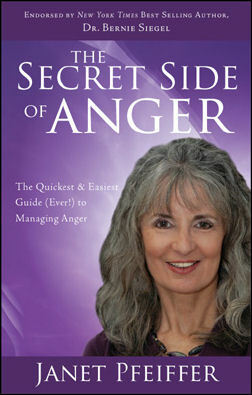 Visit PfeifferPowerSeminars.com for more information on Janet Pfeiffer or The Secret Side of Anger.